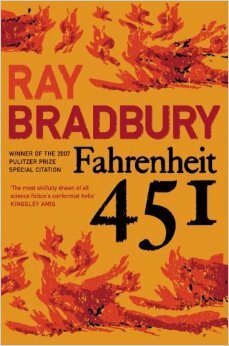 Fahrenheit 451, a novel by Ray Bradbury, is one of the twentieth century dystopias that predicted the future with worrying accuracy. At its core the book is about the destruction of literature, art, and culture more generally to prevent people from thinking for themselves; it’s set in a conformist society with a dependence on technology and there are sinister undertones of authoritative control and often death. In today’s world, nobody has launched an explicit campaign to destroy our books, paintings, or cultural artefacts (at least in the western world – which we know of! ), but the novel’s plot reminds twenty-first century readers of the backseat that literature and art often takes in a world of iPhones, social media, and catch up TV. Guy Montag is our hero, a fireman – although his job is not to stop fires, but to start them. The firemen in this world are tasked with burning books wherever they are found: “Fahrenheit 451: the temperature at which book paper catches fire and burns” is the book’s subtitle. Montag becomes disillusioned by the regime when the team torch a house filled with literature and he witnesses a woman burn with her books: “There must be something in books, things we can’t imagine, to make a woman stay in a burning house.” Nonetheless, Montag’s wife, Mildred, is a character firmly fixed in the regime and as we see Montag become enlightened she becomes increasingly terrified; however, despite their odd marriage, Montag loved his wife and it pains the reader to see their marriage destroyed. Gradually readers see Montag go from a complicit citizen to a revolutionary character. Fahrenheit 451 is a book for the sci-fi buff, but also for people who love to read. The novel is laced with literary references that expose Montag to the power of literature: to the perpetual narration of the human condition that it offers; a refreshing alternative to the oppression of the regime. Bradbury’s novel could be read as dramatized manifesto of why we still need literature especially in the face of technological and scientific advancement.